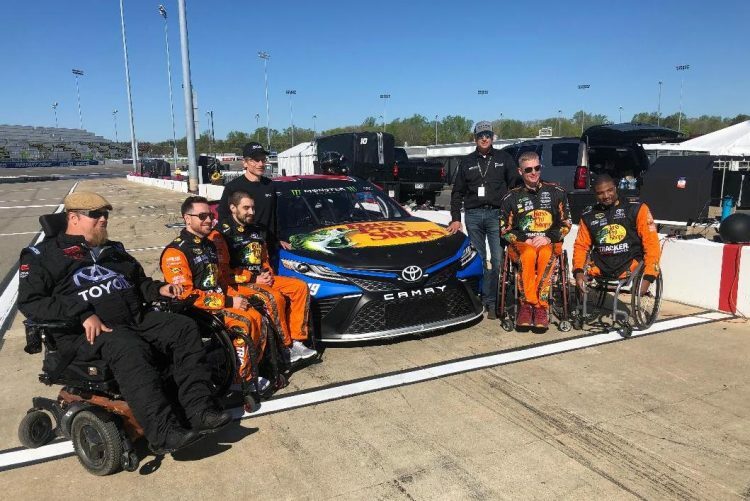 Five individuals with mobility challenges, including three U.S. Paralympians were on the fast track Wednesday (April 10), riding and driving the adaptive Bass Pro Shops/Toyota Camry at Richmond Raceway. The event served as a prelude to this weekend’s Toyota Owners 400 and ToyotaCare 250 NASCAR races at the historic .75-mile short track. It was the second event of the year for the Falci Adaptive Motorsports team, whose NASCAR Cup race car includes special components which allow those with mobility challenges to drive the car hands-and-feet free with only slight movements of the head and mouth. Before driving on their own, the participants took a few laps as a passenger in the race car with NASCAR Xfinity Series Toyota driver Christopher Bell behind the wheel. The thrill and excitement to ride along with Bell at speeds ranging up to 130 miles per hour and nearly hugging Richmond’s Raceway’s concrete wall was indeed an exhilarating experience for the participants. Steve Serio, a Team Toyota athlete and co-captain of the U.S. Men’s National Wheelchair Basketball Team when they won the gold medal during the Paralympic Games Rio 2016, exited the adaptive race car eyes wide open with an euphoric smile. “That was a surreal experience to be a rider and driver of a NASCAR race car,” said Serio, who was paralyzed after undergoing surgery at 11 months old to have a spinal tumor removed. “Coming from New York City we don’t get the chance to go that fast. That first moment when Chris took off, it was a feeling I have never experienced before. “If Chris pulled up as my Uber driver, I would be really excited to get there quickly but I would definitely strap my seatbelt and hold on. He would drive circles around any New York City cab driver. This event with Falci Adaptive Motorsports is a perfect example of how dedication to innovation can bring freedom of movement to everybody with different ability levels. ” Trevon Jenifer (two-time Paralympian) and Will Waller (four-time Paralympian), also members of the National Wheelchair Basketball Association, echoed the same feelings as Serio. “I felt like I was in a rocket ship,” said Jenifer, who has no legs as a result of being born with congenital amputation. “Chris was awesome. While it was like another day at the office for him my heart was jumping out of my chest. Being a passenger and then driving the car definitely superseded what my expectations were. Didn’t expect to go that fast. “This is an example of making things more adaptive to the disabled community. It’s awesome because I never thought I would be able to adapt to NASCAR. But there are people out there like members of the Falci Adaptive Motorsports team finding a way to make things more adaptive for the disabled. It’s all about inclusion. ” Waller, who sustained a spinal cord injury after being a victim of an inner city shooting in 1992, elaborated on his version of the experience. “The ride was fabulous and pretty powerful. Driving on my own was something else. I would love to take it on the street. That would be so much fun.” Dr. Scott Falci, a Denver-based neurosurgeon, who founded Falci Adaptive Motorsports, said he was excited about how the event turned out and looked forward to the future with more technology for the mobility-challenged. Joe Garone, who oversees the operations and fundraising for Falci Adaptive Motorsports, said the adaptive program is moving forward and felt the Richmond event was a total success. “Everyone at Falci Adaptive Motorsports extends a sincere thank you to Toyota and Bass Pro Shops for their sponsorship of the Richmond event and we also send a great deal of gratitude to the folks at Richmond Raceway for the support and enthusiasm about our program. It was such an electric atmosphere with all the participants beaming with excitement as they rode and drove the adaptive Bass Pro Shops/Toyota Camry.